All in all the ceremony was nicely done in every aspect from the barrel roll during the flyover that did not result in an air disaster (note: take that Yankees) to the image of Manny Ramirez giving Johnny Pesky a peck on the cheek. Jose did have a few complaints about the flags though. First, in theory the flags from 62 different countries represented all of the places where Red Sox fans live. This is utter crap. 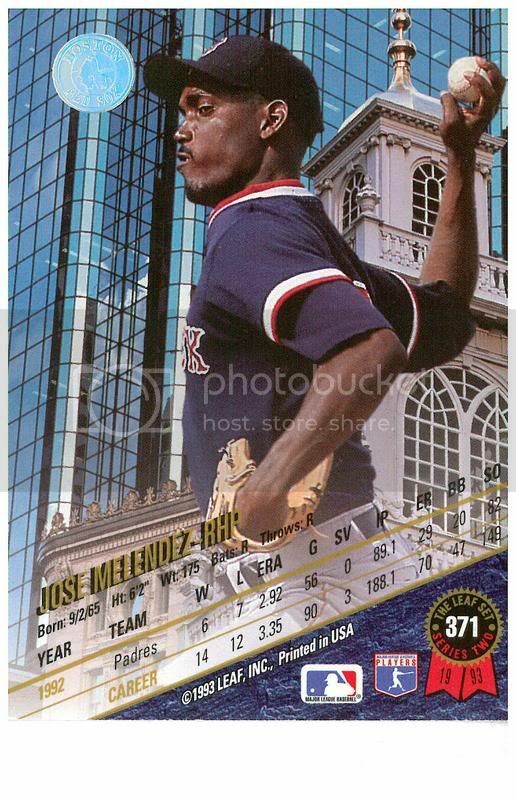 For starters, Jose has hits from more than 130 different countries, and all of them, save for the few who come by looking of Puerto Rican DJ Jose Melendez, are probably Red Sox fans. Second, the Red Sox included Taiwan on their list. While the move is brave, will it have an impact on recruiting and marketing in the People’s Republic of China? Alternatively, if they were going to go that far, maybe they should have had someone representing Tibet. Third, Jose could totally have found them some people from Albania and Kosovo. And what about Finland? That’s a big western country. They couldn’t find a single guy at Nokia? And are all of the Panamanians Yankees fans thanks to Rivera? Finally, Jose thinks they should have had about 12 guys holding Dominican flags. They deserve it. 2. But let’s not kid ourselves. The highlight of the day, even more than Daisuke’s brilliance or Manny’s triple was the emergence of a teary Bill Buckner to throw a first pitch backdoor curve to Dwight Evans. In many ways, this was a day that did not need to happen. How can you argue that the man needed forgiveness? He made an error. It was a bad error at a bad time. But it was just an error. There are thousands of them every year. They are inevitable, and yet his became the critical moment in a tragic narrative. The Buckner error was Juliet awakening to find Romeo dead. Sure, had Juliet actually been dead when Romeo killed himself it would still have been painfully sad, but it was that one shocking moment of reversal that elevated it to the spectacularly tragic. Likewise, the Red Sox were going to lose Game 6. They had already collapsed by the time Buckner made his error. Had he fielded the ball the game would have continued, right up until the next moment of tragedy. Perhaps Dave Henderson would have lost a fly in the lights and would have been forever remembered as a goat rather than as the hero of California. And then there are the other ovations. In 1987 and 1990 when Buckner emerged for opening day he was lauded by the fans, cheered like few others. Was that something that needed to be forgiven? Yet, the current persists swift and strong. At the bar, Jose heard the jokes about whether Buckner would drop the ball. On the SoSH game thread, the clever quipped that it should have been Dave Stapleton throwing out the first pitch instead. Even as the crowd was cheering, even as Buckner brought his fingers to his eyes to wipe away misty tears, the rejoinders and witticisms still dribbled along like a ball down the first base line. So maybe forgiveness is necessary, but perhaps it is not number six who needs to do the forgiving. Perhaps it is we the fans who need to forgive ourselves. We care so much, we cheer so hard, we boo so loud that rationality even among the most quantitative of sabermetricians gives way to the base instincts, the lust for glory, the hate that drives revenge. We become the mob. In Elementary Forms of Religious Life, the French sociologist Emile Durkheim described totemism as a sort of self-worship, where society revered itself as represented by some totemic animal. On rare occasions, Durkheim said, the rules of reverence normally governing interaction with the totem would be relaxed and in an ecstatic release of communal energy, the society would devour the totem. Durkheim was wrong in his description of totemic tribes, yet he was completely accurate in describing the Red Sox Nation. We worship this team. It is our totem. It is us. We revere it. We celebrate it. And yet, periodically we must devour it. Bill Buckner was the totem sacrificed. Years before Johnny Pesky, another number six played the same role. We are a tribal people, we warriors of Red Sox nation, we priests of the Green Monster, and eventually, we will always yield to that, to the ecstasy, to the anger. But not yesterday. Yesterday we were not an angry tribe reveling in our own identity, trying to exert control over the uncontrollable. Yesterday we were civilized. Yesterday we were men. And beneath all of the taunts and jeers, the fury and the fanaticism, we always knew that we were. Today, Bill Buckner knows too. Normally, Jose would just treat this as a minor technical error and move on, but here’s the thing—people seemed to find this funny. Not only did people seem to find it funny, there is some evidence that they liked it more than a standard KEYS. This leaves Jose at a bit of an impasse. Is it really worth struggling over a toast crumb flecked keyboard for endless hours when the masses are just as happy with an endless string of %20s? In search of an answer for the question, Jose did what he always does, he tried to find the correct baseball analogy. Has there ever been a baseball player who achieved just as much acclaim for comical failure as for stirring success and if so, did he keep trying to perform well, or did he simply give in to the madness? The best comparison Jose can think of are those sorry souls who are doomed to catch the knuckleball. Jose recalls watching Creighton Gubanich allow three passed balls in one inning while the Red Sox were trailing big near the end of a game. The crowd howled with delight as Gubanich flopped after pitches like a fish on hook with electrodes attached to his gills. And what was poor Creighton to do? It was probably clear at that point that he wasn’t going to be a big league catcher. Forty-seven at bats would be his whole career. But Jose bets he kept trying, kept focusing and hoping that he could turn it around. Jose does not think he would have done the same. If Jose’s incompetence was met with glee and renown, he would probably play it up. If he were Creighton “Barrel” Gubanich (note: yes, Jose has wanted to use that nickname for a long time) he probably would have started diving in the wrong direction as knuckleballs fluttered at him, doing his best impression of a soccer goalie guessing a penalty kick. If he were Gerald Ford he would have started doing headers down every flight of stairs he could find. Hell, if he were Bill Clinton, he would have followed up the Lewinsky Affair by having a woman under the podium at the State of the Union. Of course, this instinct, this flair for the incompetent may be part of the reason that Jose 20Kevin%20Youkilis:%20%20Harey%20at%20mekuddeshet%20li%20b'taba'at%20zo%20k'dat%20Moshe%20v'Israel%20(Translation:%20Behold,%20thou%20art%20consecrated%20unto%20me%20with%20this%20ring%20according%20to%20the%20law%20of%20Moses%20and%20of%20Israel). 1. Today is opening day at Fenway, and as such, the start of the game will be delayed by the ring ceremony. This ring is a token of my enormous, ungodly wealth. With this ring, I consecrate the fact that you were part of my weird, vicarious obsession of living out athletic glories through millionaires. Response: I will forever wear this ring as long as I am not at an occasion where I have to shake a lot of hands and it will cut into my skin. I accept this ring as a symbol of your love and my faithfulness. When I am a free agent and other teams come calling for me, I promise to remain eternally faithful to you, as long as you offer at least four years at $13 million per. Special for DJ Dru: I give you this ring to wear with love and joy. As a ring has no end, neither does your contract. I am pretty much stuck with you from this day and forevermore, so I might as well make the best of it. With this ring, I thee wed, and with it, I bestow upon thee all the treasures of my mind, heart, and hands, but not my wallet. I’m going to keep that. For Kevin Youkilis: Harey at mekuddeshet li b'taba'at zo k'dat Moshe v'Israel (Translation: Behold, thou art consecrated unto me with this ring according to the law of Moses and of Israel). 2. The latest news from Fenway Park today is that Bill Buckner will throw out the first pitch. Let Jose be the first to say that this is kind of cool. Buckner was a great player who took a lot of crap for an error and never, even once blamed in on jet lag. Jose welcomes this outstanding news. However, it does come with a hint of sadness, as it means that previously scheduled first pitch tossers Dennis Eckersley and Mike Brumley will be throwing out the first pitch for the Cubs. 3. This year’s championship ring features two Red Sox made out of rubies in the center. While this looks cool, it is going to be a disaster for Manny when he inadvertently throws his ring in the washing machine and it turns his uniform pink.